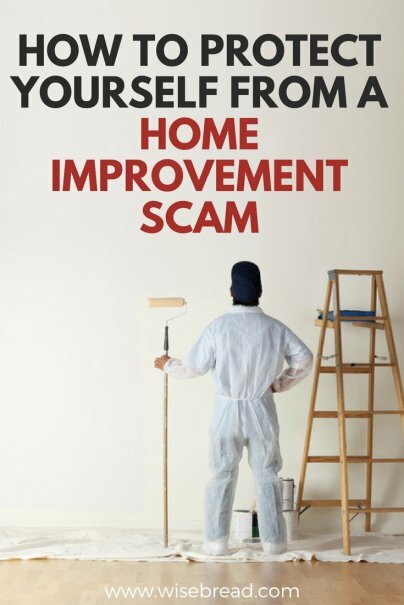 From a small task like new sod, to a major job like a finished basement, home improvement projects can become a nightmare if you fall victim to a scam. Even the savviest consumers can get taken for a ride if they don't know how to spot the red flags. So before you commit to any kind of home remodel or upgrade, make sure you know how to protect yourself from the scammers. This happens all the time, even though door-to-door salesmen seem to be a thing of the past. You'll get a knock on the door and a friendly face will tell you that the recent hailstorm means your roof is in major trouble. Or, their firm is in the area replacing windows, and because so many of the neighbors have signed up, you'll get a great deal. The patter revolves around the same kind of setup, but the result is always the same — they won't go away until you agree to sign something and hand over a deposit. Now, in all fairness, reputable companies will go door-to-door sometimes as well, but they won't use high-pressure tactics. The scammers will use every trick in the book to get invited inside and throw the hard sell at you. Don't ever get work done that you didn't actively seek out yourself; you're just asking for trouble. When you take on any kind of home improvement project, it's not the same as getting a car overhauled or a gadget repaired. This is your home. Your safe space. Before you let anyone near it, let alone into it, you want to know they are reliable and trustworthy. A simple recommendation from a friend or work colleague isn't enough. If you're any kind of savvy shopper, you won't buy anything without doing a little price comparison. The same applies to a contractor, only this is a much bigger and more important purchase. Once you have researched the best three firms for the job, ask them to each give an estimate for the cost of the service, and ask them to itemize it as well. Next, compare the estimates side-by-side and look to see who is giving you the best value for money. Remember, this is not about the lowest price but the best investment in your home. The lowest price may come with cheaper materials and no guarantee. You'd be amazed at how many homeowners are willing to pay thousands of dollars in labor for a job that requires just a little research, elbow grease, and $50 in parts. And some unscrupulous contractors are quite happy to do that simple job and charge an arm and a leg for it. Again, you live in the information age, and it's easy to not only identify a problem, but find multiple online videos and walk-throughs showing you just how to do the work yourself. Anything from replacing a washer to an entire furnace is now something within reach of many DIYers. A contract is a vital piece of protection for a consumer and you must demand one. Even if it's just a small job costing a few hundred dollars, you should get the project down on paper and get it signed. List everything that needs to be done, the costs you have both agreed upon, any materials that need to be purchased, any permits that need to be pulled (permits offer additional protection against shoddy work), and the start and completion dates. Ideally, you should have a legal mind look at it, be it a professional or someone who can help you out for free. Read every word, including the small print that can hide traps. You don't want to sign anything that could leave you high and dry. This contract will be your protection should anything go wrong and you need to take it to court. A contractor will ask for a down payment to secure the work, make sure you're serious about committing, and purchase materials. All this is absolutely business-as-usual. But if the down payment starts climbing above the 33 percent mark, you should proceed with extreme caution. Give away too much money at the beginning, and you may never see it or the contractor again.